Missing food with a little Latin flare on the GAPS diet or other grain-free diet? 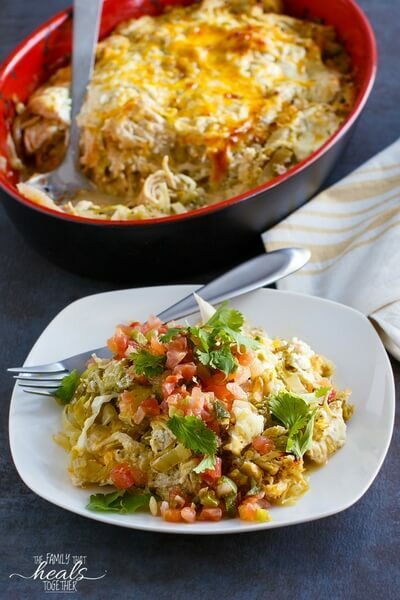 This chicken enchilada casserole recipe delivers! Grab it below. One thing you never get over missing on a grain-free diet is Mexican food. If you want to know the truth, every once in a while the craving gets the best of me and we go out and indulge. But that indulgence will inevitably result in feeling yucky later, so I wanted to try my hand at a grain-free version of my favorite chicken enchilada casserole recipe, and I’ve got to say, it really is satisfying! This recipe works if you’re on the GAPS diet, a primal-style diet, or if you lean towards paleo (just skip the cheese and sour cream; see notes below). Best of all, it replaces difficult-to-digest grains with vegetables! What could be better than sneaking vegetables into a gooey, warming, kid- and husband-pleasing casserole?! If you’re able to tolerate dairy, great! Leave the recipe as-is and cheese it up. You’ll get the most delicious, authentic flavor this way. However, if you’re dairy-free, all is not lost! To make this chicken enchilada casserole recipe dairy-free, you’ll need to whip up my dairy-free queso dip recipe, hold the ground beef. You’ll then use the dip in place of the cheese and sour cream in the casserole. If you’re keeping track, yes, that’s a lot of homemade components going into this single recipe. But hear me out. If you make a batch of my cauliflower sauce to go in this recipe, you can use leftovers for chicken and broccoli alfredo with spaghetti squash. Yum! The same goes for homemade salsa verde and queso dip: make ’em once, use the leftovers later. Really, I see it as a win-win, and when you get used to making everything from scratch, it doesn’t seem so daunting, I promise. 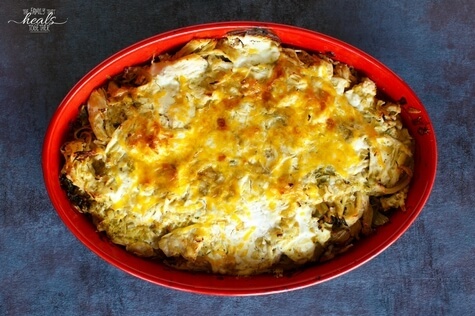 Plus, with any luck, you’ll have leftovers from this green chicken enchilada casserole. The more the merrier- this casserole is for sharing! I love making big casseroles because it means we’ll have leftovers (ok, sometimes we have leftovers; we do have four hungry boys to feed! ), which means one less meal for me to cook later. 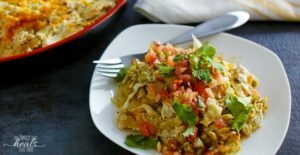 Note: if you would like to make this chicken enchilada casserole recipe without dairy, omit the shredded cheese and sour cream and replace with this dairy free queso, leaving out the ground beef. Chop the cabbage in thin slices and set aside. Layer 1/3 of the cabbage slices in the bottom of a large casserole dish; top with 1/3 of the shredded chicken, followed by 1/3 of the sauce, 1/3 of the chopped onion, 1/3 of the shredded cheese, and salt and pepper. Repeat step four for two more layers. Add extra cheese to the top for flavor if you'd like. Trust me, you'd like. Cover dish and cook for 35-40 minutes. Remove cover and cook for another 15 minutes so that the cheese becomes a little brown and bubbly on top. Remove from oven and let cool before serving with guacamole, cilantro, salsa, sour cream, or whatever your heart desires! Note: if using dairy free queso in place of cheese and sour cream, leave out ground beef and combine with salsa verde and cauliflower sauce. Share using a link below for that grain-free friend who may be missing chicken enchiladas! Want more super easy meal ideas for paleo, GAPS, and gluten- and grain-free diets? 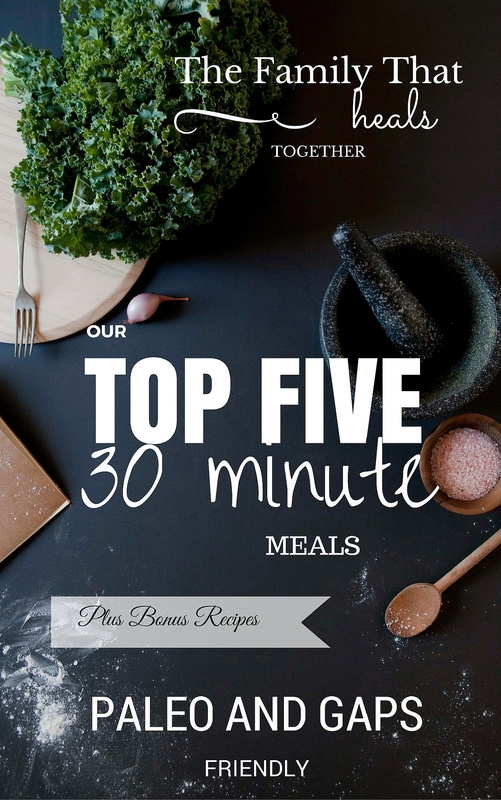 Click below to get my free e-book “Our Top Five 30 Minute Meals!